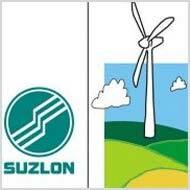 New Delhi: Suzlon Energy's board has approved a proposal to raise up to Rs 5,000 crore through the issue of securities. It is an "enabling resolution to facilitate the company to raise funds at an appropriate time should that be required," the wind turbine maker said in a regulatory filing today. During a meeting held yesterday, the board also gave its nod for increasing the company's authorised share capital from Rs 1,100 crore to Rs 1,500 crore. Mumbai: Shares in wind turbine maker Suzlon Energy Ltdsurged nearly 5 percent, its daily limit, on Monday following the government`s move to re-introduce the acceleraed depreciation scheme for the wind energy sector. The gains add to Suzlon`s 3.6 percent gain in the previous session. Finance Minister Arun Jaitley said on late Friday that the government would amend the Finance Bill in this regard. 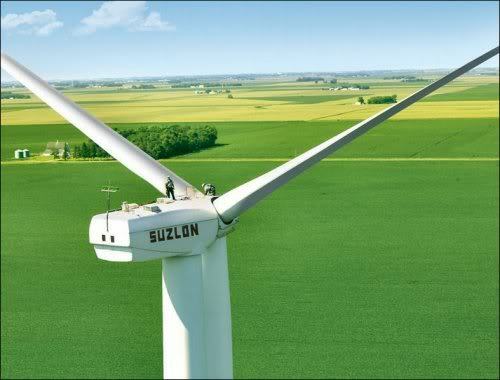 New Delhi: Wind turbine maker Suzlon Energy has bagged an order worth about Rs 750 crore for a project in Rajasthan. The order for 100.8 MW wind farms has been awarded by ReNew Wind Power. "The project is scheduled for execution at the Bhesada wind site, Dist Jaisalmer, Rajasthan," Suzlon said in a statement on Friday. It is a repeat order placed by ReNew Wind Power. Sources said the order is worth around Rs 750 crore. Renewable energy giant, Suzlon Energy Ltd has informed the stock exchange that it has surpassed the historic 1 GW milestone in UK. REpower Systems, a unit of the group that produces onshore and offshore wind turbines, has touched the milestone of 1 gigawatt (GW) installed capacity across UK wind farms. REpower UK has now become the third company to cross the 1 gigawatt (GW) installed capacity in the UK. The company has added a significant number of wind farms to its portfolio in England, Scotland and Wales. Renewable energy major, Suzlon Energy has announced that it is appointing Amit Agarwal as the new Chief Executive Officer (CEO) of Suzlon Energy today. The appointment of Agarwal as the CEO of Suzlon Energy will allow Kirti Vagadia to better focus on the financial position of the entire group. Vagadia was also looking for the role of Chief Financial Officer of Suzlon since the exit of Robin Banerjee in May of 2012. Agarwal, who is taking over the company at a crucial stage, will directly report to the chairman of the group, Tulsi Tanti. The promoters of renewable energy major, Suzlon Energy have sold 6.19 per cent stake in the company to raise about Rs 240.40 crore. The promoters of the company Girishbhai Ranchodbhai Tanti, Tanti Holdings and V R Tanti HUF sold 10.995 crore equity shares on Thursday morning and raised about Rs 240.4 crore. The shares presented about 6.19 per cent of the loss making wind turbine maker. The company indicated that the stake was sold to facilitate a corporate debt restructuring plan backed by the banks. Suzlon Group, which is a India's largest wind-turbine maker, has received an contract for 102.9 MW project from India's state run, ONGC. Under the project, the renewable energy major will provide 49 units of Suzlon's S88 2.1 MW wind turbines. The project is expected to be commissioned in 2013, a company said in a statement. The company also said that the S88 turbines are designed to withstand extreme conditions and operate effectively in medium wind regimes with lower maintenance costs. Suzlon Energy on Thursday reported its largest ever quarterly loss of Rs 1,155 crore for the three months through December 31, saying abnormal operating environment and liquidity constraints hit its business performance adversely. Revenues slipped 19.5 per cent to Rs 4,074 crore in the October to December quarter, from Rs 5,063 crore in the corresponding quarter of the previous year. Suzlon, which is currently burdened with a debt mountain of Rs 14,000 crore, has been reporting losses for the last three years. Struggling wind energy turbine manufacturer Suzlon Energy on Thursday announced that its lenders approved its proposal to restructure its net debt. A consortium of 19 lenders, led by State Bank of India (SBI), agreed to restructure Rs 9,500 crore of Suzlon Energy's Rs 13,000-crore net debt. The corporate debt restructuring (CDR) process was triggered after the wind turbine maker defaulted on its foreign currency convertible bonds worth Rs 1,189 crore ($221 million) in October last year. The promoters of renewable energy major, Suzlon Energy sold a 2.11 percent stake in the company on Wednesday in order to facilitate a corporate debt restructuring plan backed by the banks. The promoters led by chairman Tulsi Tanti sold 3.75 crore shares for about 63 crore in the company. REpower Systems SE, a unit of Suzlon Group, has received a contract spreading across several years from wpd Europe GmbH, a subsidiary of project developer wpd AG. Under the contract, the company will deliver 51 wind turbines to wpd Europe. The two companies also concluded a service and maintenance agreement (ISP) for a total of 15 years for several new projects of the company. The REpower MM92 turbines will be installed in six projects at Whittington, Springwood, White Pines, Napier, Sumac Ridge and Fairview. Each of the REpower MM92 turbines has a rated power of 2.05 MW. The shares of renewable energy major, Suzlon Energy rose after the company said that its lenders have agreed upon a debt restructuring plan. According to a media report, the lenders have agreed to a debt restructuring plan worth Rs 10,000 crore. The world's fifth largest wind turbine maker has been struggling to deal with its huge debt pile. Banks and financial institutions including State Bank of India, ICICI Bank, Axis Bank, IDBI Bank, Yes Bank and Power Finance Corporation are among the lenders of the company. Suzlon Energy Ltd, India's biggest fifth biggest turbine manufacturer, is in talks with its lenders to restructure its debt pile of Rs 14,000 crore. The Tulsi Tanti-led company said on Monday that its proposal of the corporate debt restructuring (CDR) included maturity period of ten years, a 2-year moratorium on principal plus interest payments on term-debt along with additional working capital facilities. Renewable energy major, Suzlon Energy might be looking at a likely default on loan payments on Thursday after its bond holders did not give their consent to extend repayment by a period of four months. The company might default on the payment of redemption of more than $200 million in overseas convertible bonds that become due on Thursday. Suzlon was among the leading Indian firms to take advantage of cheap funds through convertible bonds market before the global financial crisis brought a slowdown. Renewable energy major, Suzlon Energy Ltd has reported a net loss of 8.49 billion rupees or $153 million during the first quarter of the financial year till June 2012. The company had recorded a net profit of 601.2 million rupees during the same quarter of the previous year. The total consolidated sales of the company increased 10 per cent to 47.47 billion rupees. There have been some concerns in the market about the company's ability to redeem its bonds over the previous maturity date. Suzlon Group is set to sell its stake in its wholly-owned manufacturing subsidiary in China to China Power New Energy Development Co for about $ 60 million or RMB 384. Suzlon Group, which controls wind-turbine maker Suzlon Energy, said that it will sell its entire stake in Suzlon Energy Tianjin Ltd to the Chinese company. Suzlon has already signed a binding agreement to sell its equity stake in the subsidiary, however the deal is subject to regulatory approvals in the country. Renewable energy major, Suzlon Energy has dismissed media reports that French power giant, Alstom is aiming to acquire its subsidiary REpower Systems. Suzlon said that the reports indication a possible takeover of its unit by Alstom is entirely speculative. A report in the FT Deutschland claimed that Alstom has initiated discussions with the Indian company and has been granted exclusive right to access performance data of he unit. Leading renewable energy major, Suzlon Energy has reported a net loss of Rs. 286 crore for the third quarter till December of 2011. The loss of Rs. 286 crore was higher than market expectations as the company faced increase in interest costs and provision for deferred taxes. The company has reported a net loss of Rs 254 crore in the same quarter of the previous year. Suzlon Energy, which is a leading wind turbine manufacturer, has entered into an agreement with the authorities of the Indian state of Andhra Pradesh to install capacities to generate about 3,000 mw of power till 2016 through wind energy. Suzlon signed a memorandum of understanding (MoU) with the Andhra Pradesh government for setting up of the wind farms at the CII's Partnership Summit in Hydrabad, which was attended by the Chief Minister N. Kiran Kumar Reddy. The promoter of Suzlon Energy sold 3.7 crore shares or about 2.08% stake in the firm through a block deal in the open market on Thursday, resulting in a fall of 7.81% in its shares prices on the domestic stock exchange. Suzlon Energy was trading at Rs. 23.60 on the Bombay Stock Exchange at the time of reporting. The announcement of the stake sale by the founder group firms of the company came after market hours on Thursday. The sale reduced the overall share of founder group entities in Suzlon to 52.76% from 54.84%, according to a filing with the BSE.